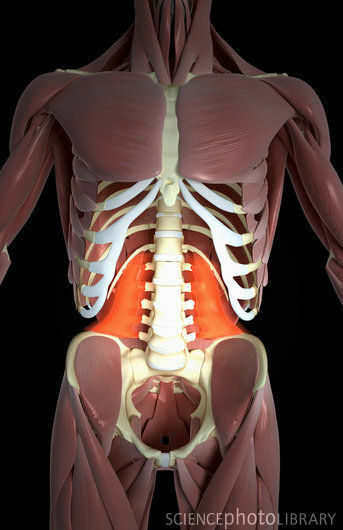 Low back pain comes from many sources–spinal joints, discs, nerves, and of course, chronically tight muscles. One such muscle is the quadratus lumborum (QL); when tight this muscle can mimic the pain of herniated discs or sometimes even kidney pain. Common symptoms are a band of pain going across the back of the lumbar spine, and low back fatigue or tiredness from standing for extended periods. The quadratus lumborum attaches to the lumbar spine from the pelvic crest to the lower ribs. It is a large, thick muscle in the flank. Quadratus stands for four, which is the number of layers present in the QL muscle. It works as a lateral bender of the lower torso as well as an extender of the low back, along with other functions. If you are having low back pain, you would be wise to get checked by a sports chiropractor. In the meantime, you can try these stretches. If your QLs are tight, you may get some relief from this basic side bending stretch. In an upcoming post I will show a little more advanced stretch, so that you can take your QLs to the next level. Enjoy.